Time To Take Her In. Well, I’m all finished with Frida, so this morning I took her and entered my wall hanging into the fair exhibits. I had so much fun trying to capture the essence of Frida, maybe not her looks, but her colorful way of life. She will be viewed by hundreds of people, some will like her and some will not, but that’s ok, because I am pleased with the outcome. I think I influenced my daughter and grandson to enter their projects as well. My daughter had made the Mad Hatter’s hat into a donation box for the school play and decided to enter that. It’s a fun and unique project. Our grandson loves to draw and he is quite good. Since boys love drawing robot type figures, that’s what his project was. I want to make and enter a project for our county fair. But the deadline is September 17th. So I have to hurry. It will be a quilted wall hanging, so I really need to hurry up, actually I need to rush. I do have the background fabric along with the face, the eyes, the hair, lips and the eyebrows. I’ve made some felt flowers. Now all I need is to put everything together. Have you guessed who the person is that I am trying to put together? I managed to finish a baby quilt that I started 2 years ago. This little boy will finally get his “baby quilt”. Like I’ve said many times, life does tend to keep you busy with unplanned illnesses or commitments that are unavoidable. But I’m thinking this little great, great nephew of ours will still be able to enjoy his blanket. I chose a Dalmatian print for the backing and binding. 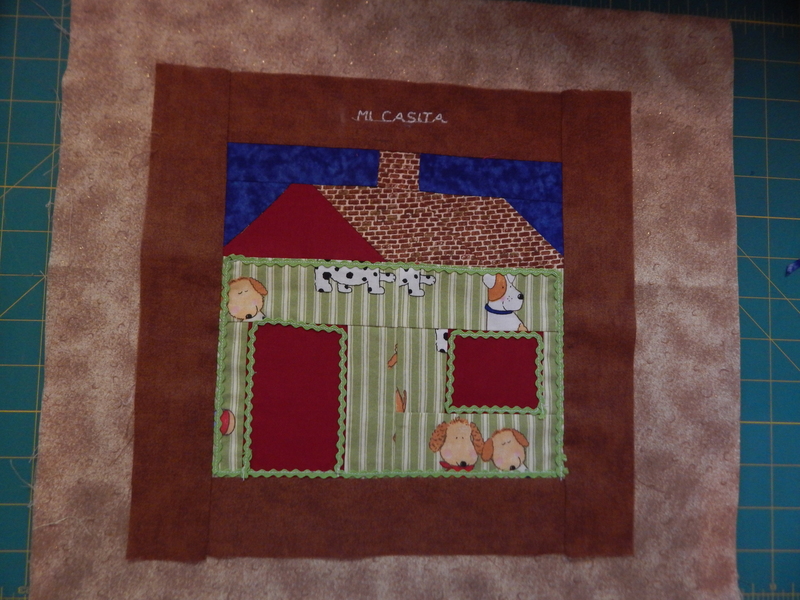 Plus I added a dog, that I traced along with a bone for him and machine embroidered them onto the quilt. I have about 3 more baby quilts, along with one for my oldest daughter, plus one for my youngest daughter, that would like one for her school fund raiser next year. I’d better get busy. I had no idea this little house would give me so much trouble. From now on I will make my own pattern. Although I did finish it, I had to improvise. Some of the measurements were not correct, because I read and reread the measurements and no bueno, so I had to make a few changes. This will now be the center block for a quilt that will go to a baby boy who will come later this year. I’m thinking of using brown, green and some blue and red for the colors.